Oh all right. I wanted to make cupcakes, had to make cupcakes, needed to make cupcakes. But what to add on top? Something sophisticated from this book perhaps. 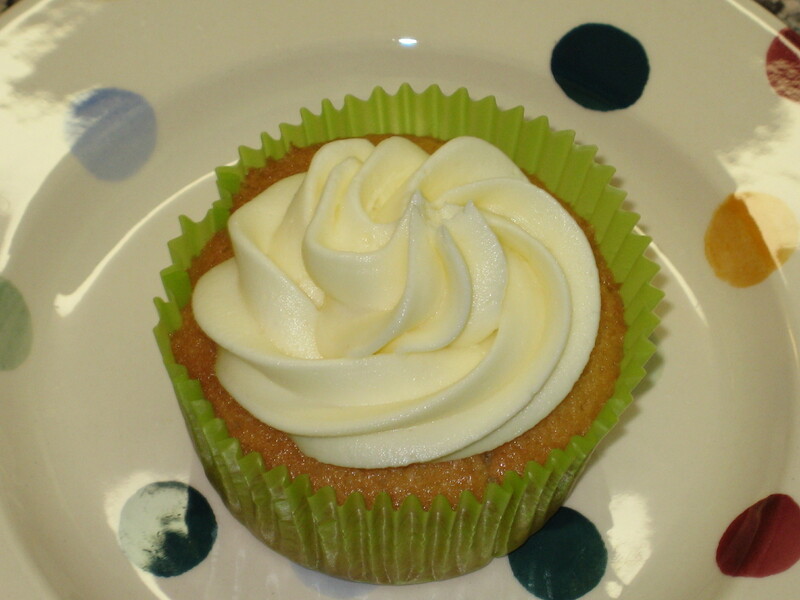 What I thought these gorgeous damp lemony cakes needed was some green icing and sprinkles. Just look at the fabulous goodies above, sent from a friend in Minnesota, yummy. I love the postman, well not LOVE him, but love it when he rings the bell with goodies – you know what I mean! The little ones can not wait until we have time to make the gingerbread house, and neither can I, I am a child in an adult body. I have been busy today finally making the Christmas puddings. I have put off making them, and then was overcome yesterday with a desire and a will to get them done but after weighing out most of the ingredients I was missing 2 crucial items: sugar and eggs. How did that happen? Never mind, the local shop had the necessary items and ta-da I have 3 puddings. We don’t eat all 3 on Christmas day, I mean we do love this delicious traditional pudding but even we can only manage one on THE day. The puddings keep for quite a while so the other ones will be used up in the coming few months. Then I had a bash at making marzipan because I couldn’t find what Brits call marzipan in Holland so I made some. I need to make the royal icing to cover it, but I can not find any glycerine to keep the icing from setting rock hard, so I will have to ice it nearer to Christmas Eve when we will have the first slice with the essential piece of cheese. I ran out of bread on Sunday, or more to the point I hadn’t been shopping for a week and the cupboards were bare. 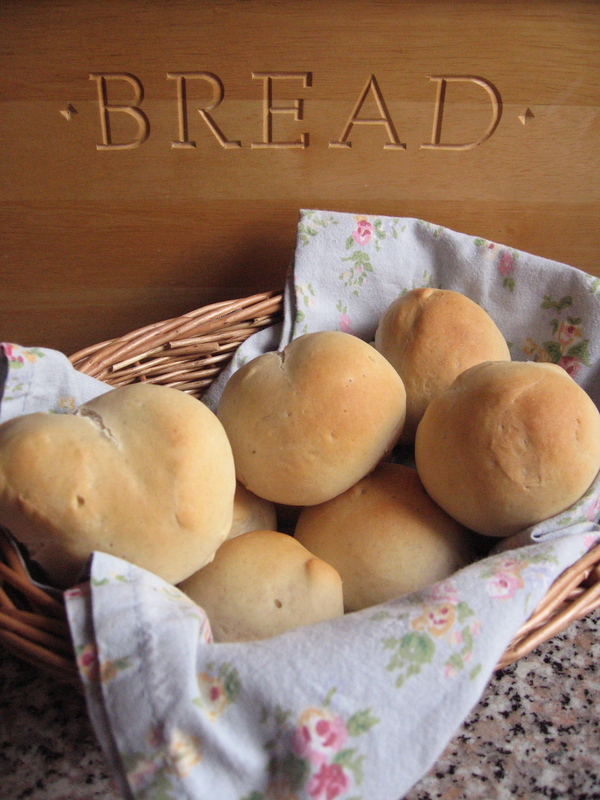 So I made some bread rolls for lunch, and they were delicious. I used a recipe from Hugh Fearnley Whittingstall’s Family cookbook and they were delicious served with the dutch Gouda and yummy cranberry relish I made earlier in the week to accompany a roast chicken. Friday was Children in Need day and at my children’s school they could wear what they liked and have crazy hair. This was great fun, my son has never been one for dressing up but he was very excited about having spiky hair. My daughter wanted to wear her Minnie Mouse dress and have 3 bunches in her hair. They both looked great as did the rest of the children including the teachers, and I believe they raised qute a bit of money. With the theme of a fun day I baked some cookies for the children, and for me, with Smarties in them. 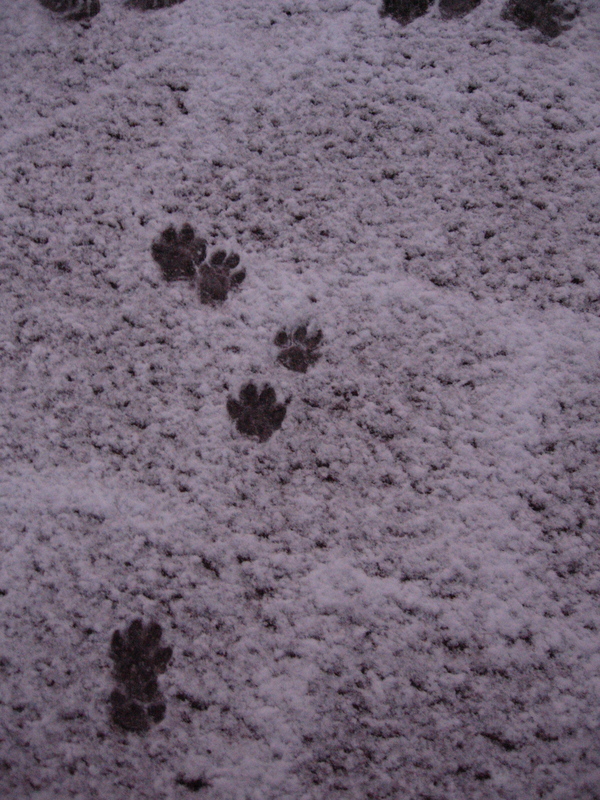 You would think that I never do those kind of things for them ever judging by their reactions. Suffice to say they were a huge hit. 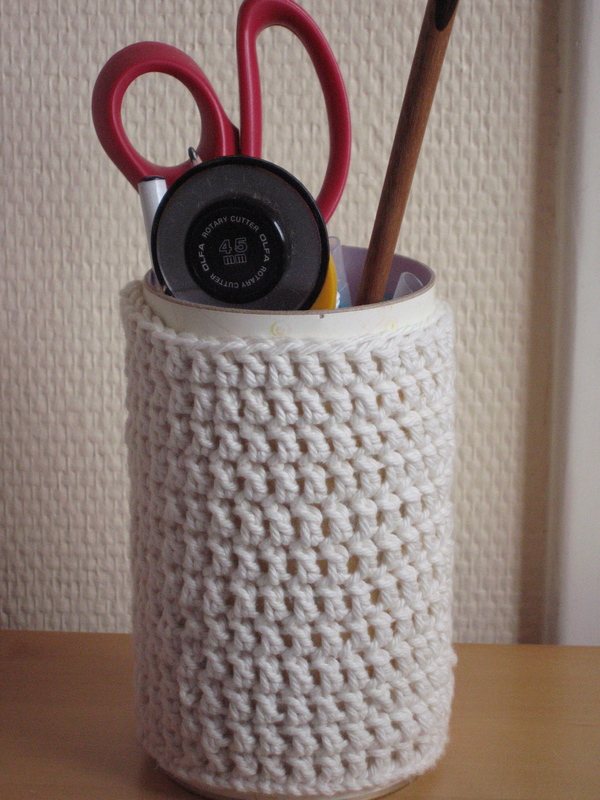 Yesterday I decided to look at what I wanted to make for Christmas and I have now re-done my TO DO List so that it doesn’t look overwhelming or confusing – which I am pleased with. 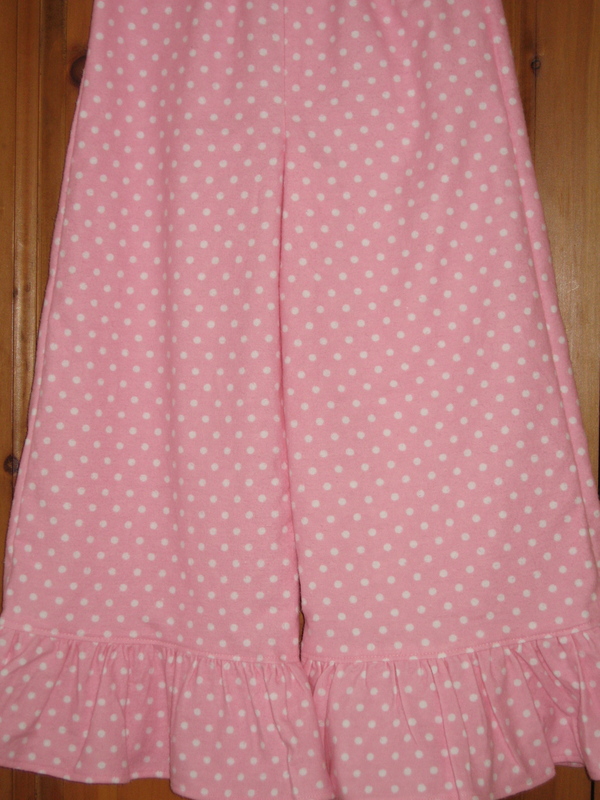 So because I felt organised I decided to have a bash at the ruffle pants/trousers from Portobellopixie. I had some pink spotty flannel which I tried to shrink as much as possible as per a post on the Superbuzzy blog. The pattern came together really quickly, but it would have been quicker and easier if I had a serger, I don’t, and certainly I won’t be able to persuade my darling husband to part with even more money (our washing machine broke yesterday) in the near furture so I had to go over all the seams with zig-zag, not difficult, just time consuming. My daughter, as ever, is one of my biggest fans and she is delighted with them and intends to wear them later when she gets home from school. I have noticed in blogland a few people are already baking their Christmas cakes so I really have got to get the ingredients at the weekend to start mine. I love Christmas cake served with a piece of cheese. My Mum is from the North of England and as well as having yorkshire pudding with golden syrup for pudding (not something I have ever fancied to be honest), she has passed on the tradition of having a piece of Wensleydale cheese with our fruit cake at Christmas – yummy. I was browsing blogs the other day and came across Chanelle’s delightful one. 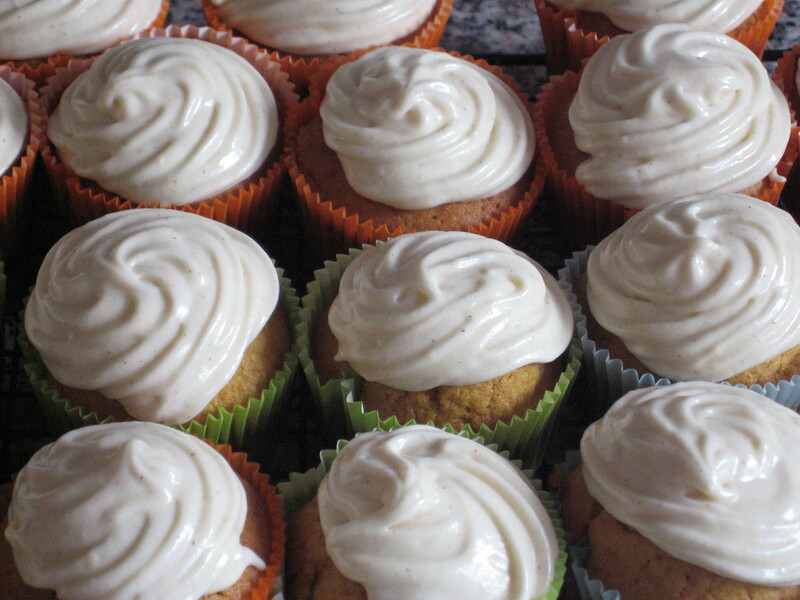 She had made some truly scrumptious pumpkin cupcakes which I just had to try as I was feeling very autumnal. I bought a pumpkin and checked that I had the ingredients for the pumpkin spice recipe. (Living in Europe means you have to bake from scratch!) And wow they were gorgeous. I confess to eating alot of these myself – I did share them but mmm, I kept making the excuse for afternoon tea – even at 9am in the morning. Ha Ha!! The children go back to school on Tuesday after their half term break and I am looking forward to getting back to doing some sewing. I have got a number of projects I want to finish before starting anything else. Well, that is until something else catches my eye and I just have to make it. 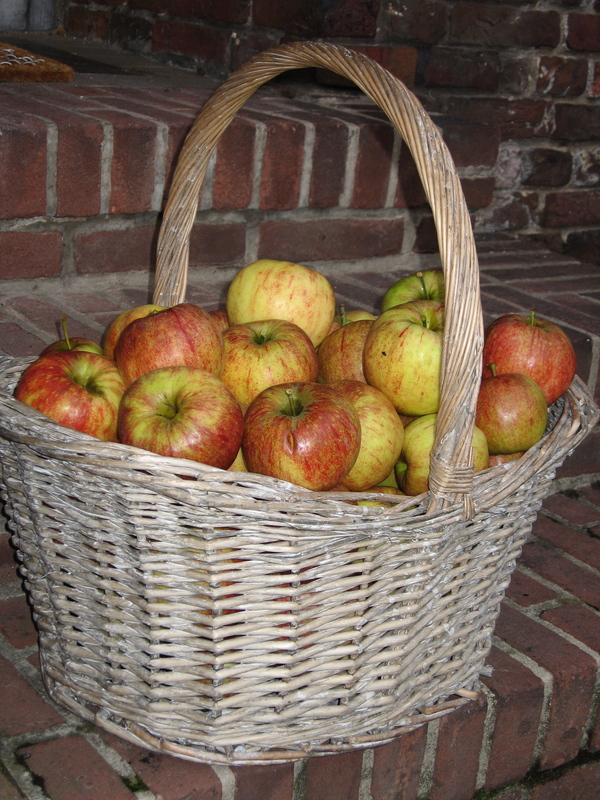 Apples, apples and more apples…. 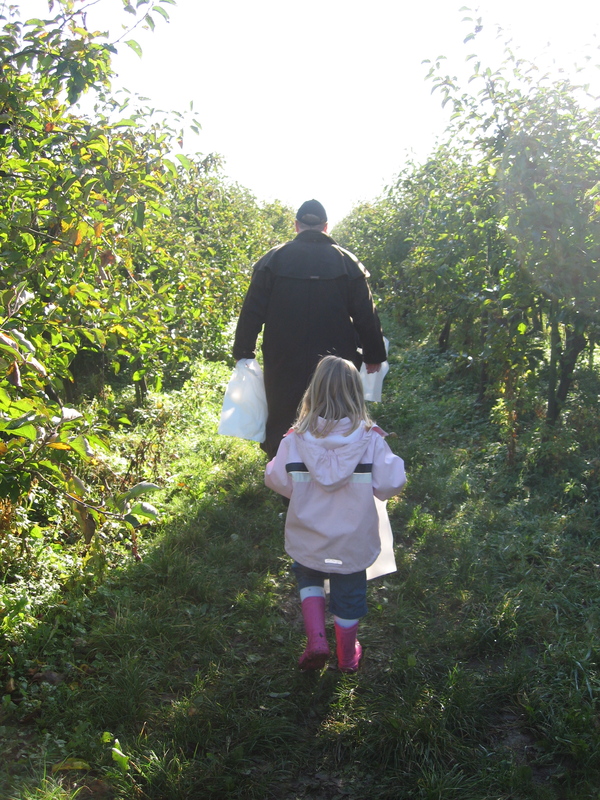 On Saturday we went to an orchard about 30 mins from us to pick apples. We had a super time, the children had thought that they wouldn’t have been able to reach, but there were still plenty of apples at their height so they thought this was fantastic. To make it even more fun it had rained all day the previous day so there were huge muddy puddles on the walk to the orchard which were perfect for wellies. 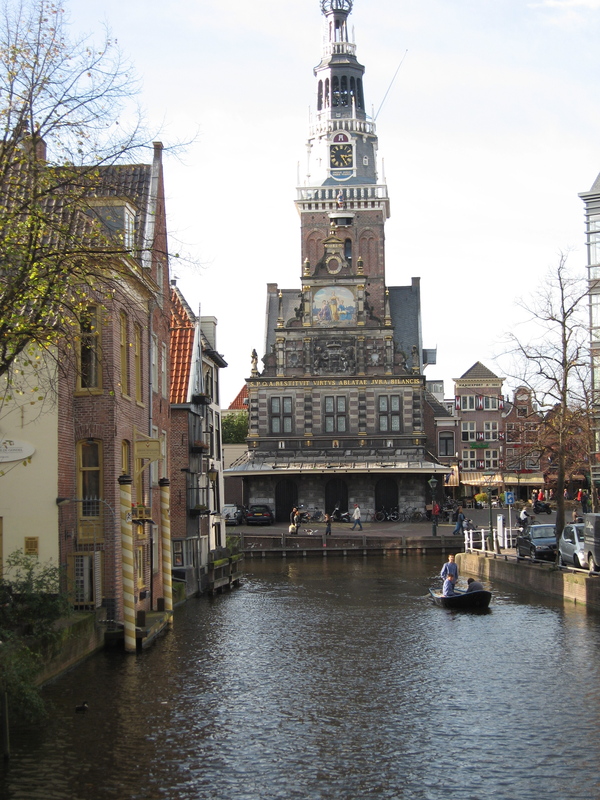 After that we went took a drive north to Alkmaar for a wander around. It is where they hold the traditional cheese market during certain times of the year. It was such a beautiful town that we will try and go again on a Friday to see the cheese. I now have to decide what to make with all the apples we picked. This morning we had pancakes with cinnamon apples,(minus the icecream) and for dessert later I have cooked some apples with some raspberries to eat with a dollop of greek yoghurt. Mmmm. If anyone has any apple recipes they want to share – I will be mightily grateful. 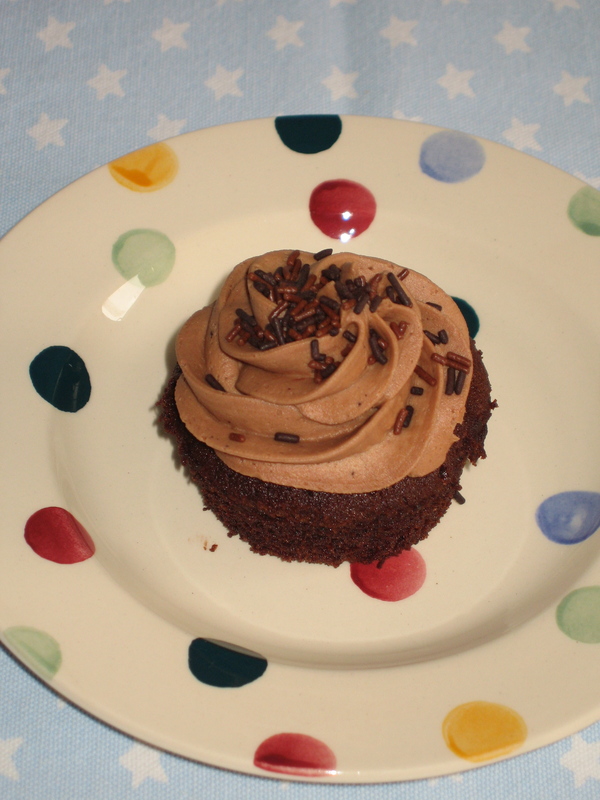 Giselle asked me for an easy chocolate cupcake recipe the other day and this is for her as well as anyone who like me can’t resist a good cake. Put everything in a mixer, beat until pale and fluffy. Pop spoonfuls into prepared cupcake tin and bake for about 18 to 20 mins mins at 180c degrees. If you want you could mix in a big handful of chocolate chips just before you put them in the tin. Makes about 12. As for icing follow the instructions in the other cupcake post but omit the lemon juice add 2 sifted teaspoons of cocoa to the icing mixture and 2 teaspoons of water. 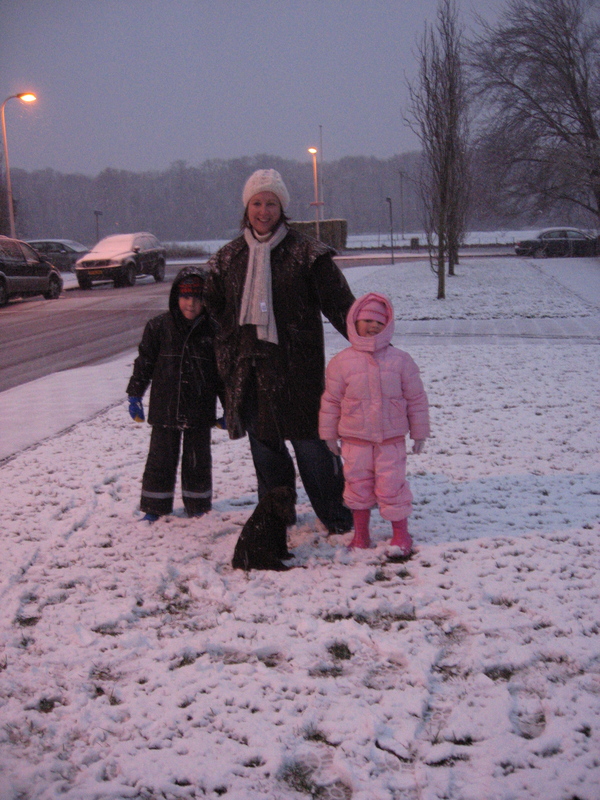 I have had quite a few things to do this week including going on my son’s school trip to Space Expo in Noordwijk. He is obsessed about space so he could barely contain himself and wants to go back this weekend with Daddy. unfortunately he will have to wait because we are going to the UK for the weekend. I have nearly got everything made to take back I just have to make an oven mitt , I found the tutorial on skip to my lou, which I will tackle this morning. I finally had an afternoon of baking and whipped up some lemon cupcakes, chocolate chip cupcakes and some currant and sultana cupcakes. I only took a picture of the lemon ones as the light was so bad that afternoon due to heavy rain. The recipe is very simple and it is my mum’s fail safe 6,6,6,3 combo, so it is in imperial not metric and it always means getting out my old scales! To make icing, cream all the icing ingredients in a mixer for about 5 mins until light and fluffy. Spoon into an icing bag and pipe onto cooled muffins. This recipe made 12 standard size and 8 mini sized cupcakes. Enjoy with a cup of tea. Yum.